Roof shingles, like anything else, are subject to wear and tear. As your first line of defense from the elements, it is a good idea to know what to look for, and what to expect when it comes to caring for your roof. Because every region of the country has different weather patterns, roof inspection is one of those preventative maintenance jobs that if neglected can cost you way much more than what it normally would in terms of damaged roof boards, studs, and even interior ceilings and walls. As a cursory starting point, you should look for shingles that are curling, blistering, cracked or peeling. Additionally, you should also look for loose or missing shingles. Check flashings on the roof. Flashings are the metal components of a roof that cover interruptions in the roof plane, such as around dormers, chimneys, and vent pipes. If it appears there is damage, such as cracked caulk or rust, fix these problems right away, or call a roof contractor to repair. Inadequate or faulty flashing will allow water and condensation to enter the interior, causing not only rot or mold but possible damage to interior walls. Homeowners should carefully inspect the seals around vent pipes to ensure they are in good condition to keep moisture from working into the underlayment. In your roof inspection, you should look for the presence of moss, lichen, or mold. This could be a sign the roof is decaying underneath. Note: Black Algae stains are cosmetic, and not indicative of decay. Your roof should not have a spongey feeling like walking on a track or child’s playground. Soft spots indicate water damage, and are a sign replacement is necessary. Ice damage can occur in areas where water may have the ability to sit on the roof. As ice dams occur, it can have negative impact on your roof. Always inspect under eaves and overhangs to look for damage that might indicate water leakage, especially at points of the roof that don’t conform to the regular roof plane, such as dormers or skylights. Asphalt roofing materials have a granular surface, much like fine gravel. As the asphalt ages, it becomes brittle, and these granules will be lost over time. If you find piles of colored grit from asphalt roof tiles in the gutters, that’s a bad sign — those sand-like granules cover the surface of roof shingles and shield them from the sun’s damaging ultraviolet rays. Look for bare spots in asphalt shingles, and inspect closely for signs of tearing or warping. If you notice shingles curling up, it is time for replacement. If you find upon inspection that you have questions as to what is normal, or are not sure if you need to consider replacement, give Erie Construction a call for a FREE inspection. Your roof protects your family and your home investment. Let Erie Construction help keep you covered with a longevity that will keep you covered for years to come. While these are strategies most have heard before, they should also be common practice. Instead of rehashing the basic strategies listed above, we want to focus on methods that are less obvious, but offer more cost savings. Most bathrooms and kitchens have 2 to 4 bulbs each, which with standard light bulbs makes for 120 to 240 watts of wasted electricity per hour. By switching to compact fluorescents (CFL) or the even better LED bulbs, you gain bulb lifespan in addition to a watt reduction to 20 to 50 watts per hour. With fall a few short months away now is the time to consider you roof. Crisp temperatures often bring higher utility bills, not to mention drafts. Once winter delivers snow and rain, leaks can become evident. Ignoring a leak can worsen and could result in interior damage or even mold or roof deck rot. While replacing a roof can be a significant decision, it also helps protect your biggest investment; your home. It gives you the chance to start fresh with a new exterior look and offering a great way to express your individual personality and add real value. So, you are ready to consider it, but where to begin? We are here to help take the mystery out of the roof replacement process. Before meeting with a contractor or salesperson, it is helpful to understand the basic roofing system components to better be able to understand the roofing jargon. Gable: The triangular section of the outer wall at the peak of the roof. Also a type of roof. Hip: The intersection of two roof planes that meet to form a sloping ridge running from the peak to the eave. Off-ridge exhaust vent: Individual exhaust vents usually located on the upper half of the roof that allow warm, humid air to escape from the attic. May be round, square or resemble a pipe or stack. Under-eave Vent: Intake vents located under the eaves of the roof that help draw cool dry air into the attic. What Roofing System Is Right For Me? A newer product on the market, synthetic slate has gained popularity. Some features of synthetic slate are that it is lightweight and easily customizable in color, which is not possible in natural slate materials. One drawback to synthetic slate is that due to its relative newness to the marketplace, the warranty is largely unproven. The materials could last upward of 50 years, but that has not been proven at this time. Cedar shingles are a very durable product, and are very resistant to wind. Western Red Cedar is the most popular style of this type of roofing material, typically seen in Northwestern states like Washington. While cedar is beautiful, there are several things to be aware of with this type of roofing material. They largely cost significantly more than asphalt roofing, have a poor fire rating and often need breathing room to swell and dry out in seasonal weather. The most widely used roofing material is asphalt. Most typically, the shingles are a mix of fiberglass and cellulose mix. They can be easily customized to various color schemes and generally can be found for a quick DIY project. They offer a moderate lifespan of 15 years if properly maintained throughout the year. They are most commonly a B fire rating, which means that they are combustible. In the event of a fire, they are likely to burn and implode into the burning building. Another concern with asphalt shingles is that they often will loosen around chimneys and pipes, as well as they can curl, buckle or blister in the elements like snow, wind or sun. It is a common misnomer that all metal roofs look like those found on a barn or warehouse. In fact, if you like the look of the above-listed roofing options, without the drawbacks, metal roofing may be for you. 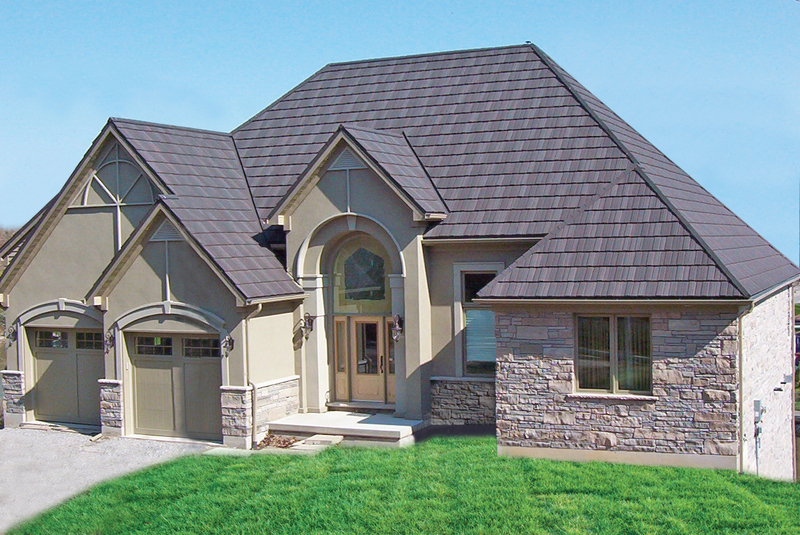 Metal shingles come in a variety of styles reminiscent to their asphalt and cedar-shake counterparts. They can be customized to a wide variety of colors, offer a Class A fire rating and offer a lifetime transferrable warranty. They will not buckle, curl or peel, and can withstand all that Mother Nature has to offer. Additionally, metal roofs are energy efficient and can lower your utility bills year-round. Are you interested in making your house more energy efficient, adding a unique and distinctive design element with the added benefit of the last roof you will ever need? Consider a metal roof. The advantages of metal roofing allow homeowners to invest in their homes with products that will last a lifetime. We look to shed light on the benefits of cutting-edge metal roofing technology to those who may have never considered it, while addressing some of the most frequently asked questions with regard to this growing trend in the building materials industry. What Is The Cost Of Metal Roofing? While the initial investment for a metal roof is more expensive than that of its traditional asphalt counterparts, over time, metal roofing costs can be economical with a high return on investment. In addition, there is an abundance of savings opportunities that will recoup some of the initial investment such as Energy Star tax credits, a reduction in energy costs, a decrease in homeowner’s insurance costs while increasing the resale value of your home. Will The Style Make My House Look Like A Barn? In a word, no. This misconception often comes from what is traditionally seen on commercial buildings. Residential metal roofing, however, offers a variety of distinctive, versatile designs with some that are reminiscent of traditional asphalt shingles. These beautifully crafted styles offer a multi-faceted appearance and allow for a broad range of colors, styles and inspiration that will rejuvenate the curb appeal of your home. What Makes These Environmentally Green & Energy Efficient? Steel is one of the most recycled materials in the world, with more than 50% of the steel supply producing recycled content in the US. A new metal roof offers the advantage of being 100% recyclable, while being largely comprised of recycled materials itself. Ensuring this environmentally green, sustainable design will never end up in a landfill. Additionally, due to solar reflectance and thermal emissivity, an Energy Star® qualified roofing style can dramatically lower the surface temperature by up to 50°F, which can lead to a significant reduction in your energy costs through the lifetime of the roof. What About Fire or Rust? With traditional asphalt roofing, the roof can be at its most vulnerable. In a house fire, embers can quickly drift onto the roof, igniting the shingles as they go. This can be a catastrophic side effect. With metal roofing shingles, this is not an issue as they have a class A fire rating and are non-combustible. This means they are the most fire resistant. With regard to rust, homeowners can rely on the innovative rust-proof technology that combines the strength of stone coated steel with the premium advantage of minimal maintenance. How Will Metal Roofing Hold Up In Extreme Weather? Mother-Nature has had a remarkably fickle temperament in the last year. From bitter and snowy mid-west winters to torrential downpours at the start of spring and summer. Metal roofing is designed to withstand all environmental factors. With their lightweight durability, metal roofing shingles are crafted to resist rain, sleet, hail and snow. They are proven to easily shed snow and ice which protects the structural integrity of your home. Your roof is the focal point, and the crown of your home. With the premium advantages of metal roofing and the lifecycle costs, stone coated steel roofing makes an attractive investment that lasts a lifetime. Give us a call today for your free estimate! LIFX Smart Bulb is set to revolutionize home lighting. This Wi-Fi enabled bulb allows you total control of your home lighting via your smart phone or other internet-enabled device. Control color, intensity, and even schedule your lighting around your needs.